I announced back in August that I would be hosting another virtual race, this time in honor of the date, 10/10/10 (HERE). The cost was free and I would be giving away a few fun prizes. The distance was a 10K. This could be completed in one run, or multiple runs, inside or outside, by your lonesome or with your family by your side, even as part of a "real" road race of a longer distance. Flexibility is everything. Fit it in when you can fit it in. About that .... yeah, well ... it's officially 21 days after the 10th of the month and I still haven't posted the race results. Bad race director! Little Diva is playing and reading and hubby and Little Dude are napping. So again ... Flexibility is everything. Fit it in when you can fit it in. and for following my journey!! 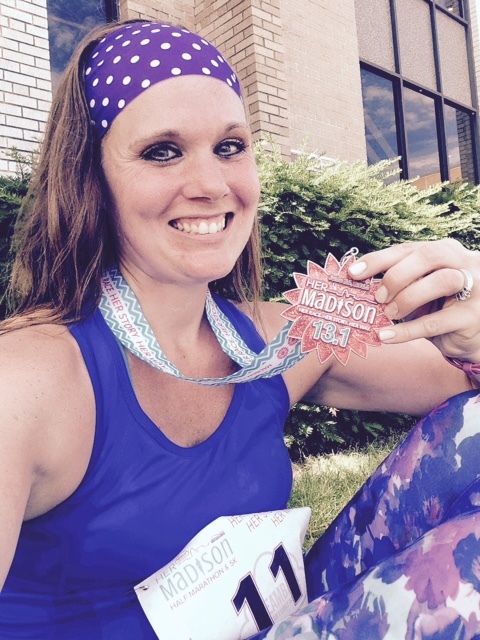 Shortly before I ran marthon #3, I decided that I wanted to add another half marathon to my schedule. 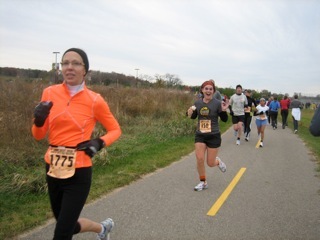 The Innaugural Haunted Hustle Half Marathon (HERE) was set for Saturday, October 30, in Middleton, WI. When I had looked for fall full marathons, I was interested in this race (since they offered a full, half and 10K distance). However, I wasn't sure if I wanted my next 26.2 mile journey to be on a new course with a new race. I figured it was safe to try out with a half marathon, since that distance is doable and my absolute favorite distance. On Friday afternoon, the kiddos and I headed over to the expo. It was near the start of the race, at the Madison Marriott-West, near the Greenway Station shopping center. There were race organizers available right as you entered the hotel. They were directing you exactly what to do and where to head. They had some cute Halloween decorations and scary music playing. We proceded to packet pick-up which they also tried to have Halloween-themed. We received a cinch backpack and a nice technical top. Then we entered the expo, which was a decent size for it being the innaugural race, but still disappointing. There were about ten vendors that were "big" vendors which high ticket items. I didn't purchase anything, which is probably a good thing. The race started at 7:45 am and was about a half hour drive from our home. I had set the alarm for 6:10, but Little Dude woke me up by 6:00. Everyone else was sleeping. 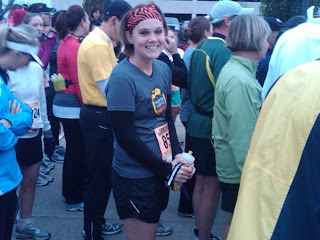 A lot of runners were wearing costumes, but I had decided just to dress in orange and black. (maybe next year -- I was inspired by everyone else!) I got dressed up in my Haunted Hustle technical top (pretty cute and festive) and layered it with a long sleeve technical top, which was paired with black Nike Tempo running shorts. Since I surprisingly didn't have one to match (gasp! ), I borrowed Little Sis's orange and black zebra print Bondi Band (HERE), and accessorized with orange and black knee high socks from Chrissy's Knee High Socks (HERE). And yes, I did my makeup!! I drove across town all by my lonesome. It was supposed to be chilly at the start (30-something degrees and a high of 50-something for the day). Hubby and the kiddos stayed home. I exited Hwy 12 and there was a slight backup of traffic with thirty minutes til the start. It was moving though. I ended up parking across the street at the Marriott. There was ample parking everywhere, including over at Greenway Station and the neighboring parking ramp. There were people in fun costumes everywhere -- lots of superheros and chicks in tutus. I headed to the start line and there were two rows of porta potties. Lines were about 10 people deep with 15-20 minutes to go. Lines moved fast and I had no trouble getting in. I headed towards the folks that were lining up behind the start line. I surprisingly was able to locate my parents, Little Sis and her boyfriend in the sea of people as I was downing a Gel. There was a GREAT turnout for this being the first running of this race. I chatted with my family a bit and gave my mom my toss away sweatshirt and headed to get in place. I ended up seeing a friend in the sea of people and we chatted a bit before the race started. A guy next to me, "Dan the Man" had heard me chatting with my friend. He asked what my goal was and I said that I almost always am at two hours or under. This was his first half marathon and he said that I would be his pacer since that was his goal. The pressure was on. The marathon and half marathon started together. The 10K runners would start a half hour later. It was a bit crowded in the sea of people and continued to be quite crowded (though very doable) until the second half. The race organizers had posted a course description for each of the three distances before the race. Though I couldn't recall or envision everything, it was quite helpful. Here was the half marathon description. Half Marathon - The marathon course starts in Greenway station with a flat and open first mile. At Capitol Brewery the course turns onto a 1.5 mile stretch of rolling hills on residential streets. Racers then run a moderate uphill stretch to the top of Parmenter hill before turning onto a steep descent down South Avenue. After winding back into downtown Middleton, the course crosses University Avenue just before mile 4. The rest of the course is nearly pancake flat with the exception of a few small hills along the conservancy bike path. After mile 4.5 the racers take a right hand turn into the scenic, tree-canopied, stretch of the Pheasant Branch Nature Conservancy for a half mile out and back section. The course continues along the paved Pheasant Branch conservancy path for another 5 miles through scenic prairie and woodland before arriving back to downtown Middleton. The course takes a right turn onto Elmwood and rounds Capitol Brewery for the final 1 mile homestretch to the finish. Half marathon course map is available (HERE). The first aid station and first mile came up very quickly. My knee high socks were already falling down -- oh well! Then we were headed up a pretty decent hill and then through a nice neighborhood. "Dan the Man' ran with me for a bit and then ended up in front of me. I would follow him for several miles (about a half dozen people behind him). He was always in sight. He was headed out fast and strong. I was feeling great, too. I was able to see my family once within the first four miles and then a friend around mile four. Crowd support was ample and off and on. Aid stations were place quite frequently. I carried my handheld water bottle again and only stopped to get a couple of sips of Powerade at each stop. The Powerade was incredibly sweet and sugary-tasting. There was not enough water in it. I decided just to dump it most of the time, because I didn't want to get sick. My handheld carried water and I sipped on it throughout the race. I had two gels inside and my car key. I picked up another gel along the course (Vanilla). I believe there were 3-5 opportunities for the half marathoners to get gel along the course since there were a few turnarounds and you could hit some of the aid stations twice. Remarkable. At mile 4.5 we headed into the Nature Conservancy. It was beautiful with the fall colors that we still had left. This was an out and back along the path and the bridges and streams. Very pretty. It was fun looking for friends along the out and back. we turned around at mile five and I believe that this is wear the full mararthoners headed straight. It cleared out a bit here obviously. I looked for Linda from Mom Running from Cancer (Read her race report HERE). I spotted her in her adorable witch costume, just before we headed out of the Conservancy. She looked cute and strong! We headed out along a paved trail. There were some "haunted" aid stations. We headed along the pond on a nice scenic route and then we headed to another out-and-back area of the path. I heard a dude yell my name and wave. 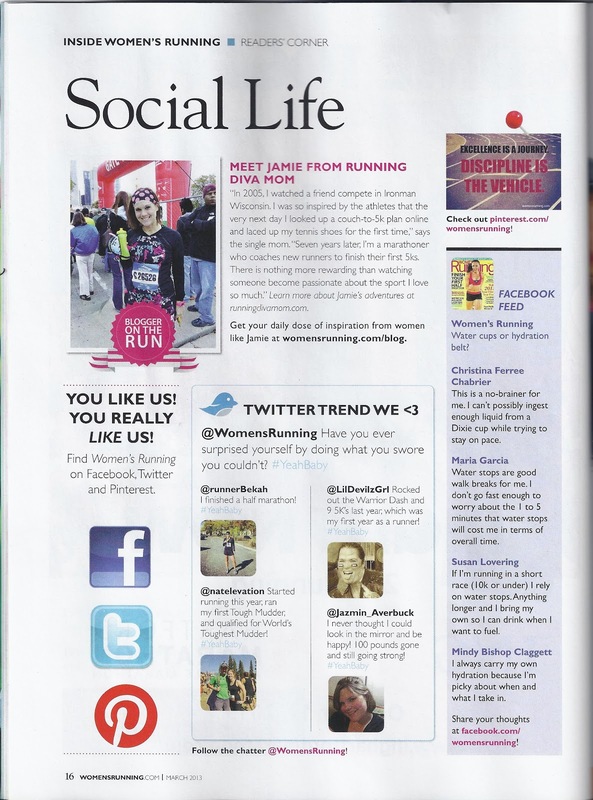 It was Jason, a reader of Running Diva Mom. I said "hey" and kept on. He was flying past the other way and was literally speedy and flying. I kept heading down the path and onto the turnaround. I was approaching "Dan the Man" and almost caught up. Just before I exited the path, I ran into Linda from Mom Running from Cancer again, who was heading out on the out-and-back. She had her camera out and snapped this shot of me. Thanks, Linda! She looked like she was having a fun race, which I think is just awesome. We veered off the path and I was just behind "Dan the Man". 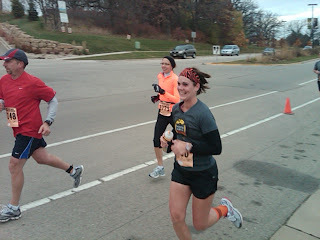 I spotted my parents and my sister just before mile 9 and was easily able to muster a smile since I was having a blast. I caught up to "Dan the Man" and told him that he was actually pacing ME! I saw my family again at 9.5. Dan and I chatted a bit for the next mile and hung together. He thought that he had gone out too fast. I assured him that he was doing awesome. He was 54 years old and my dad's age, and was running his first half marathon. I thought that was friggin' awesome. To top that he had a three year old GRANDSON with my son's name. We had a good laugh and he looked forward to seeing his little grandson at the finish line. I kept consulting my watch and told him that he was setting a really high bar for himself for his first half. WOW! There was no doubt that we were going to break two hours this race (something that I hadn't done since the Disney Princess Half in March) and that we BOTH may PR (My 1:55:59 PR was set at the Madison Half Marathon in May 2009). I was stoked. He told me I was speeding up a bit. I was excited with only two miles to go. We both downed some nutrition. He was suffering from tummy problems and wasn't sure if he should use the porta potties. I assured him that there was one at the finish line!! Trying to encourage him to keep going. He did, leaving the porta potties behind. Later he said he was glad he did, because he was feeling a little better. With about 1.5 miles to go, he sped up. I felt comfortable and didn't join him. I was not hurting, but didn't want to suffer the last mile. With one mile to go we veered back towards the start line and back to Greenway Station. We went up a slight hill and veered around to the crowd waiting us at the finish line. I saw my family there, which was awesome because when they came to see me at the Chicago Marathon in 2008, they couldn't even get close to seeing me finish my journey. I crossed the finish line with a smile on my face and my watch read 1:54:45 (a PR by over one minute!). I met up with my family. I was sweating and they were freezing. It was a perfect day for racing, but not for spectating. I felt awesome. My dad said he was proud of me, and that made me feel even more awesome. I saw all sorts of people I knew from other races and high school crossing the finish line I saw Linda cross and chatted with her for a bit. Dan the Man was still looking for his grandson and had crossed the finish line in under 1:54:30. I was sooo very happy for him ... he was beaming. He shook my dad's hand and told him that I was awesome. I thought that he was pretty awesome. I grabbed a space blanket to warm me up (no longer sweating!). The Greenway Station restaurants were offering food to runners, but I didn't take advantage of the refreshments. The medal was cute and festive for the Halloween season. Although I agree with several complaints that it was small and tiny. It was only the first year for this race and I'm sure that as the race grows (although already extremely popular!) that the size of the medal will too! I was very impressed with by how well this race was organized for it being the first year and the fantastic turnout. The location was great for locals and out of town guests, great parking, fantastic scenic course, ample crowd support, easy for spectators to navigate, more than sufficient water stations, tons of gel, cute themed medal, and a nice technical race shirt. Only complaints would include that the expo could be expanded to more exhibitors, larger medal for next year, mix the energy drink better so that it's drinkable. Otherwise, no gripes. Recently, I came across this cool website, Belly Charms (HERE). Don't let the name fool you. They sell everything from belly charms to custom necklaces for women and mothers and Vital IDs. I especially love the adorable handmade scrabble tile pendants (HERE). They offer a lot of unique styles, sayings and themes. You'll find something beautiful and inspiring the affirmation and inspiration jewelry section (HERE). I was really happy to learn that Belly Charms also sells safety ID bracelets for adults and children (HERE). 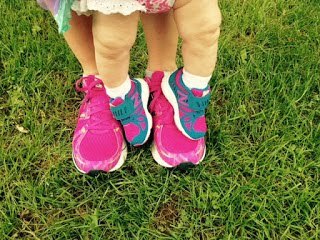 Safety is a huge concern for both runners and mothers. I have several wrist IDs already and wear them out on every run. I hear of people that even wear them walking around town. You just never know what will happen when you step out your front door. 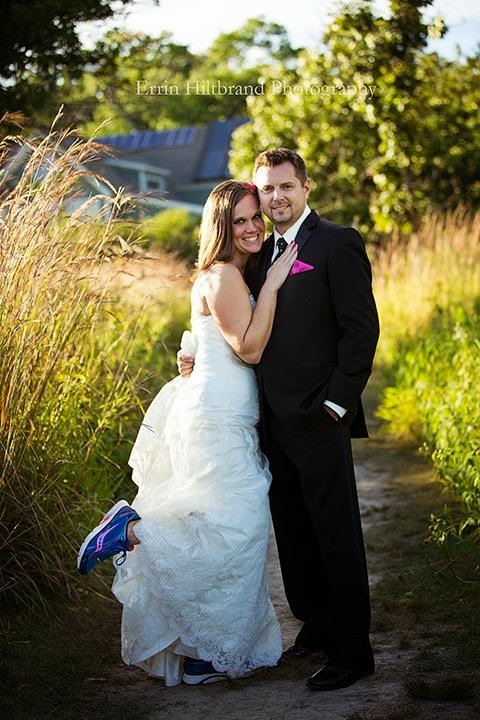 I received one of the Runner IDs for Shoes (HERE). I simply wrote my emergency contact information on the waterproof ID card, slid it into the ID holder and velcroed it onto my shoe laces. It stayed in place, didn't move or bounce and most importantly kept me safe out on my run. If I were to get injured and weren't able to speak for myself, the ID said right on it, that there is runner information INSIDE. Medical staff would be able to locate my family immediately. The Runner ID is available in yellow and red. Retails for $11.99, which is pretty affordable for something so valuable. The Sport - Runner ID and reflective system is a perfect ID solution, and it is essential safety equipment for runners, joggers & cyclists. It stores your important contact and emergency information and can easily be attached to your athletic shoes. 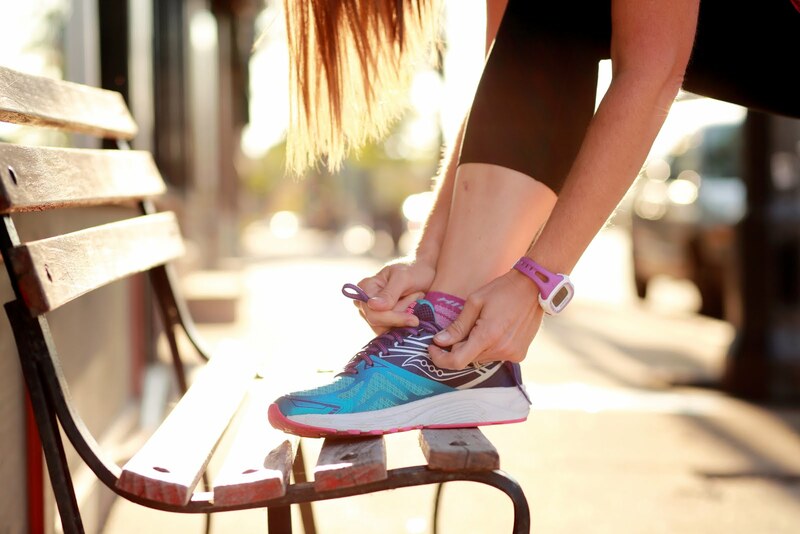 The Runner ID for shoes is designed to provide vital lifesaving information to paramedics in the event you are involved in an accident, or if you suffer a medical incident while exercising. Fits securely and does not move when in use. 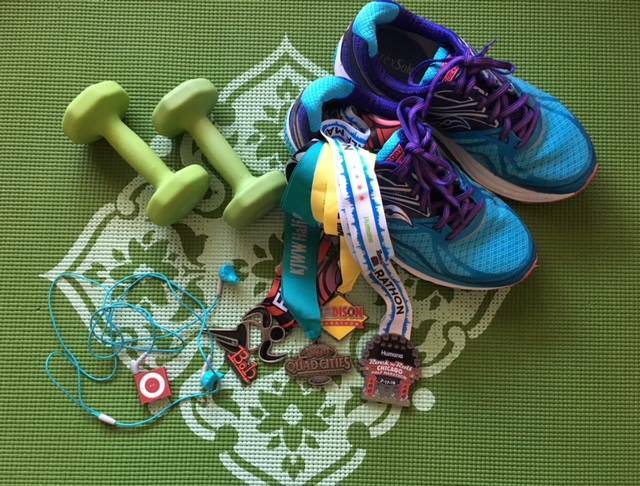 You'll never forget your ID - always fitted to your favorite running shoes. Highly reflective - utilizes 3M Scotchlite™ silver reflective material (essential for jogging low-light conditions). Easily updated - spare ID card included. Fits most footwear types with either laces or Velcro™ closures. 100% waterproof & tough construction. Alternatively can be worn fitted to your belt or worn around your neck using a chain. Why wear a Sport ID? The Runner ID is designed to provide a convenient, lightweight and effective way for you to carry your information and is an ideal training partner. It can easily be located by paramedics. The Sport ID for shoes can be a lifesaver by providing paramedics with your vital medical & allergy information. In addition, this runner ID allows for up to 3 emergency contacts to be stored. Be visible during the hours of darkness, whether you are cycling to work in the early morning, or out jogging late in the evening, the Sport ID for shoes makes it easier for others to see you! Featuring 3M Scotchlite silver reflective material, this Runner ID makes you more visible to others, reducing the potential for you to be involved in an accident during the vulnerable hours of darkness. Carrying your ID & wearing reflective gear is just as important as putting on your seat belt when getting into your car, or strapping on a bike helmet to go for a ride. Not having ID as part of your running safety gear while participating in outdoor activities is a significant risk, a risk that should be addressed and considered carefully before you set out on your next run or ride. What is you were involved in an accident and the hospital did not know who you were or who to contact? In the event of an accident, we all want our family to be contacted immediately & want to be sure we receive proper medical treatment. Wear Sport ID to protect your self. It is as simple as that. 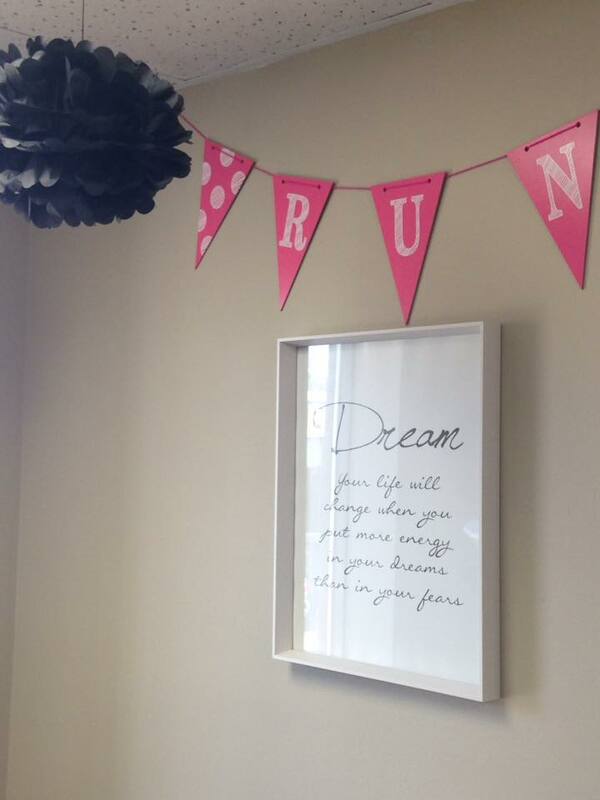 At Vital ID we encourage everyone to wear Runner ID and to be safe participating in their chosen sport. It's better to be safe than sorry - Wear ID, it just may save your life! Enter now though Friday, November 5. When purchased my last pair of running shoes, I decided to browse my local running store's selection of new energy bars and energy gels. I came across Bonk Breaker Energy Bars (HERE). 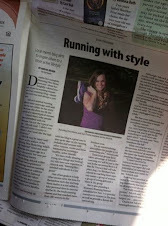 The name was obviously intriguing, since I was running a marathon in a few weeks and the flavors sounded amazing. Being a mommy, I've had my fair share of PB&J sandwiches and actually love them. So, a Peanut Butter and Jelly energy bar sounded fantastic! I also picked up the Almond Butter & Honey flavor. I tried one for breakfast one morning and loved it (not as pre-run fuel). It kept me satisfied, when I paired it with a banana. And, it was totally yummy. I contacted Bonk Breaker and told them that I enjoyed my experience. I was told that they were baking some FRESH ones that day and would be sending some to me the next day. Freshly energy bars?! Yum! I received a few of the three flavors: Peanut Butter & Banana, Peanut Butter & Jelly, Almond Butter & Honey. They also sell Peanut Butter & Dark Chocolate Chip. Each bar has about 250 calories and 35g carbohydrates and 8g protein. They are worth every calorie! They're a nice pre-run energy bar, breakfast bar or afternoon snack. I had a PB&J Bonk Breaker Bar, fat-free yogurt and a banana before I ran my marathon earlier this month. It was the first time I had one before a run (which I know, you probably shouldn't try anything new on race day! 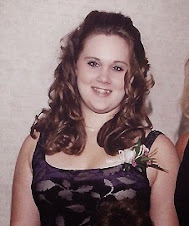 ), but my tummy had no problems and it kept me fueled. I even set a 25 min PR that day! I usually have trouble getting anything down on race morning and HATE chewing before a race. My gag reflexes are in full effect with my nerves. These were easy to chew and went down with ease. I loved the Almond Butter & Honey bar when paired with a pumpkin spice latte! A great fall breakfast, before a short treadmill run. Organic Rolled Oats, Brown rice crisps (brown rice flour, malt, salt), B -Breaker TM (Brown rice syrup, Natural crunchy peanut butter [peanuts, salt], honey), soy protein isolate, Blackberry jam (blackberries, pure cane sugar, fruit pectin, citric acid), flaxseed meal, brown rice flour, evaporated cane juice, sea salt. At the end of the summer, I came across Baby Rock Apparel (HERE). They sell hip children's wear with an edge. When I found Baby Rock Apparel, I immediately sent the website to several friends that have similar taste. The clothes were just too cool not to share. On their site, you will find a unique assortment of stylish baby clothes, trendy toddler clothing, as well as, casual boys apparel & edgy hip baby gifts & punk clothes for children. They sell several pieces that you've seen in the celebrity parents circles. This online boutique sells tons of great items for the hip parent that wants their kids to be just as trendy. Little Dude is sporting the Honor Thy Mother Boys T-Shirt (HERE). Perfect for little dudes who want to give props to mama! Made in the USA of 100% cotton, this burnout fabric is put through an extensive process showing years of weathering and each striation in this semi-sheer fabric captures a true vintage worn in feel, combed for softness and comfort. Little Dude is a chunky, almost three year old. He wears a Size 4 very comfortably. This top looked great paired with a pair of cargo shorts in the summer and layered with a fitted long-sleeve tee and jeans for fall. The cotton top did not shrink in the wash and washed up well after the few times he's already worn it. I love the hilarious onesie sets (HERE). These are unique baby shower gifts for the hip mama. The tutus and pettiskirts (HERE) are also totally adorable for the little divas. They are surprisingly very affordable. Looking for some hip pacifiers?! Check out their pacifier and clip sets (HERE). You will surely find something fun to suit your little one's style. 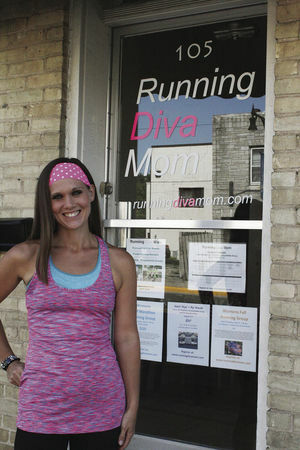 Baby Rock Apparel is offering readers of Running Diva Mom 15% of their orders. 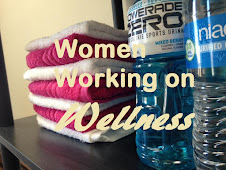 Use coupon code "runningdivamom" at checkout. Start stocking up on holiday gifts and stocking stuffers now. Last month, I was contacted by the wonderful "Commander-in-Chica", Meg, from Chica Bands (HERE). Little Diva and I were able to select some fun, non-slip headbands from her ever-growing collection. I chose a glittery fuschia number and Little Diva chose a fun zebra print headband. Chica Bands are a non-slip, nonbinding Hair Band. There are several of these on the market right now. They are all the rage and prices seem to really vary, depending on the creator. Chica Bands are relatively affordable. The prices range from $12-17 for adult headbands. Little Diva is almost seven years and sported an adult size headband. The Chicitas collection (HERE) is recommended for ages 4 and under. 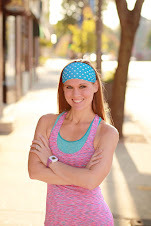 These headbands are great for running, walking and any other aerobic activity. They're great for sports, dance, gymnastics, too. Your little one and their teamates will love the Sports Bands (HERE) and Team Colors Bands (HERE). The bands are made with a special lining that keeps it in place -- no fuss. We've worn these running, walking and just bumming around town. They're super cute with your hair up or down. Perfect for keeping the whispies (and sweat) out of your eyes. Over 200 styles to choose from!!! 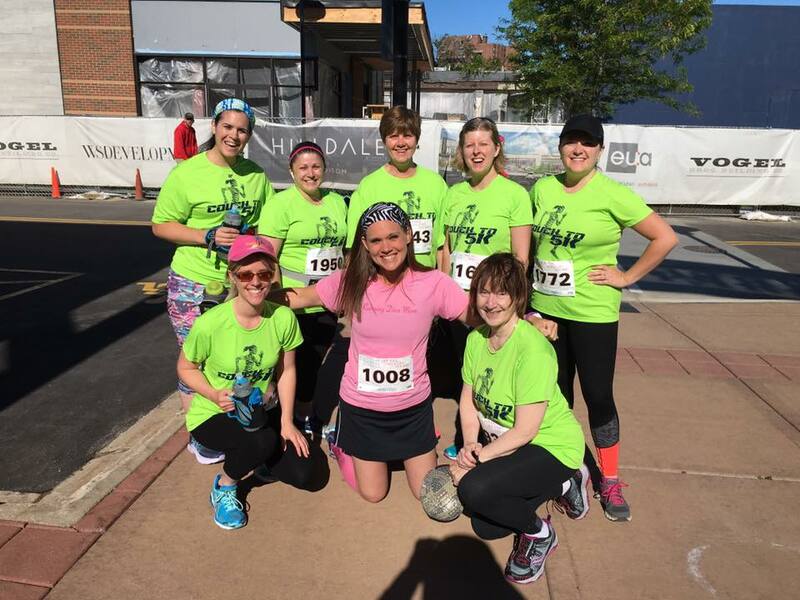 Chica Bands will even make custom headbands for you and your running group or sports team! Chica Bands are easy to handwash and drip dry. These have held up well wear after wear. Enter now though Thursday, November 4. My family was recently given the opportunity to review tube socks from Skater Socks. You can read all about my fabulous experience HERE. Please visit Skater Socks online HERE and start shopping. There were 87 entries in my recent giveaway. Two winners were chosen at random to receive one of the awesome Skater Socks prize packages (pictured above). Congratulations, Jill & Karyn!!! Please email me at ( runningdivamom at charter dot net ) with your name, email and mailing address. And, I will get you your prize! 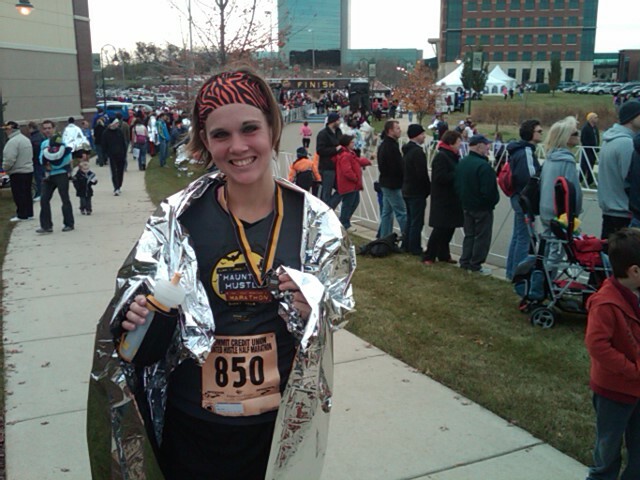 Recently, I hosted a 10/10/10 10K Virtual Race (HERE) in honor of October 10, 2010. My run was pretty un eventful. I ran it it on the treadmill. And, I did not "race" it. I ran a comfortable 6.6 MPH pace (my odd pace that I always run at on the 'mill). I ran with Little Dude playing along side me and watching Diego on DVD. I stopped 3 times for snacks for the little guy and Go Diego Go DVD malfunctions! I sped up a bit and sprinted at the end. I ran my 6.2 miles in 55:50. This has unfortunately, been my longest run since the marathon ... sigh. Several of you have emailed me with a link to your race report ... but I know that many of you have not. 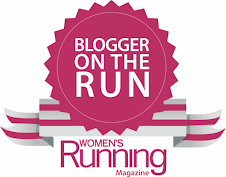 If you did run the virtual race and posted a report on your blog, please email me ( runningdivamom at charter dot net ) with a link. I hope to get my act together and post the results and prizes early next week. I have really enjoyed reading all of the posts and seeing all of the fun photos ... and great finishing times! You people rock! Mileage has pretty much sucked this month. I have a half marathon next Saturday and have not put anything in longer than this virtual 10K, since my marathon on October 3rd. I ran low mileage the week after my 26.2 mile journey, just to recover. I was going to run twelve miles last weekend, but ran nothing after I caught strep throat. Since getting strep, I have had a mongo cold and cough all week and have taken much needed rest (thanks to Nyquil). On Sunday, I had a terrible night's sleep. I couldn't breath, due to a cold and couldn't swallow. I went to the doctor to find out that I had gotten Little Dude's strep throat (grrr...two weeks later!). We had our pumpkin patch adventure on the calendar for over a month and it's the only date we could fit it in on a weekend. So, off we went. And, it was a blast. 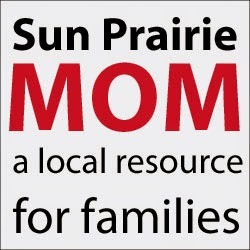 I browsed the Moms in Madison website (HERE) for some ideas on pumpkin patches and day trips. Ultimately, we decided to visit Schuster's Playtime Farm (HERE) in Deerfield, WI this year. It's not too far from our house and we had visited the farm five years ago with Little Diva. WOW. The farm expended .... tremendously ... over the past five years. The place was packed, the sun was out and the day was beautiful. Suddenly, I felt a little better (or perhaps the Penicillin was kicking in?!?!?)! They had ample parking and had several new play areas and attractions. They also had an adorable barn with some crafts and a bakery that sold seasonal fudge (think pumpkin pie! ), caramel apples and other sweet treats. Well worth a one-two hour drive if you are looking for a day trip. We spent about four hours there with with the kids that afternoon. We each purchased a $7 wrist band for the farm fun package (pricing list here) . It included entry into the small corn maze, the play yard, a ticket for one ride/attraction, animal farm/petting zoo, pig races, and a hay ride out to the pumpkin patch (pumpkin not included). Tons of port-o-potties and even two outdoor family restrooms with regular toilets and sinks. It was great for one that is potty training and another that has to go all the time at the last minute! They added these adorable little play houses that the kids spent FOREVER playing in. One was set up like a school and the other like a general store. They enjoyed playing together, playing pretend and making new friends. They also had some fun attractions that you could purchase cheap tickets for: Jumping pillow, Corn cannon OR Pumpkin blaster, Barrel Train ride (which the kids are enjoying below), Gemstone Mining (which was really popular), and several other fun activities in the evening such as haunted forest, mazes and bonfires. The kids can enjoy digging in the mini kiddie tobacco barn maze and play in the corn sand box. Here, Little Diva is making a "corn angel". The hayride seemed to be coming back every 20-30 minutes and the lines were getting long, but there was plenty of room for everyone. We took about a 10 minute ride out to a pumpkin patch and grabbed some fun, unique pumpkins this year. We paid for our pumpkins by the pound after we returned back to the farm. We purchased five nice pumpkins and only had to pay $8. We also porchased several fun mini pumpkins later on at the farm. I laughed when someone told Little Diva that we certainly had some interesting pumpkins. She said, "Well, we're an interesting family!". Love that kid! I was recently given the opportunity to review a custom necklace from Amy Cornwell Designs. You can read all about my fabulous experience HERE. Please visit Amy Cornwell Designs online HERE and start shopping. There were 177 entries in my recent giveaway. One winner was chose at random to receive a $25 gift certificate to Amy Cornwell Designs' online store. Congratulations, Sarah!!! 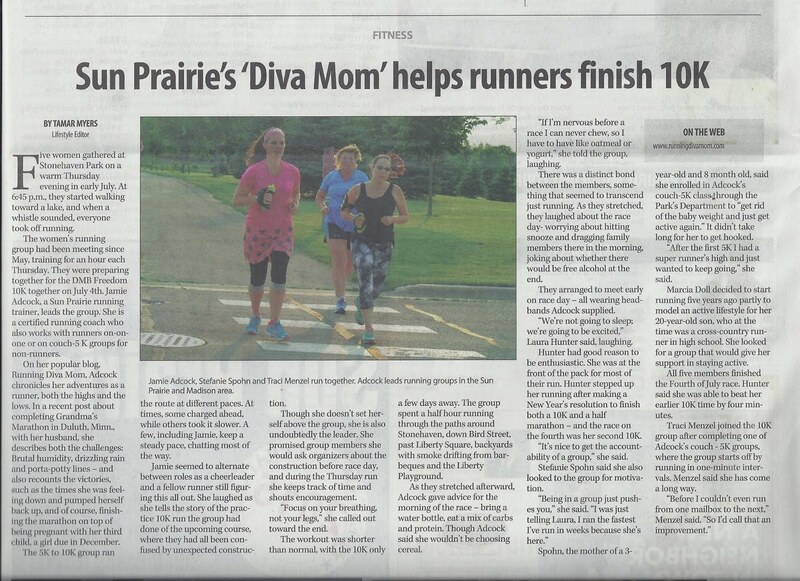 Please email me at ( runningdivamom at charter dot net ) with your name, email and mailing address. And, I will get you your prize! 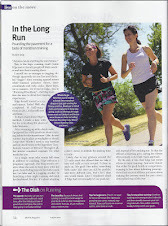 I was recently given the opportunity to review a long sleeve Marathon Girl Tee from Runalicious. You can read all about my fabulous experience HERE. Please visit Runalicious online HERE and start shopping. Congratulations, Colleen!!! Please email me at ( runningdivamom at charter dot net ) with your name, email and mailing address. And, I will get you your prize! 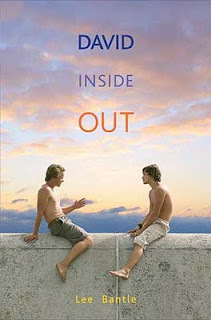 I was recently given the opportunity to review David Inside Out by Lee Bantle. You can read all about my fabulous experience HERE. Please visit author, Lee Bantle, online HERE and start learning about this and other titles. One winner was chose at random to receive a copy of David Inside Out. Congratulations, Heather!!! Please email me at ( runningdivamom at charter dot net ) with your name, email and mailing address. And, I will get you your prize! I was recently given the opportunity to review a Tag*a*Long for Little Dude and Little Diva. You can read all about my fabulous experience HERE. Please visit Tag*a*Long online HERE and start shopping. One winner was chose at random to receive a Tag*a*Long of their choice. She has seven children, and can definitely use this Tag*a*Long!! Congratulations, Catey!!! Please email me at ( runningdivamom at charter dot net ) with your name, email and mailing address. And, I will get you your prize! I was introduced to Skater Socks (HERE) earlier this summer. The family run business has customer service as their number one priority, while selling their quality, retro tube socks. All socks are Made in the USA. They also offer 100% money back guarantee if you are not satisfied for any reason. Afraid of a blister or that the knee high socks will fall down? Why not try them out and see? Little Diva, Little Dude and I were all able to try out Skater Socks tube socks. Don’t we look like a cool family from the 1960’s?!?! I was able to run in them just fine, without them falling down. They were actually quite comfy. I always love how the knee high socks look, when paired with a running skirt or pair of shorts. But, hate it if they fall down. These stayed in place while walking and running. I’ve worn them a couple of times now. Our socks have washed up well. Colors did not fade, fit did not change and there was no shrinkage. Skater Socks sells tube socks for infants, children and adults. Enter now though Sunday, October 24th. A couple of months ago our treadmill (whom I knew for 10 years and only had a relationship with for the past five years!!) finally called it quits. RIP. We kept our old treadmill in the lower level of our home that is unfinished and used for storage. There were no windows, no sunlight and the walls weren't drywalled. So, we were running next to insulation. We were inhaling all that icky stuff, it was starting to stink down there and those long (and even short) runs felt even longer. The kids enjoyed coming downstairs with me to exercise, and we kept toys down there. However, it was a job just to get everyone situated down in the "dungeon" with snacks, drinks, toys, etc. We purchased a new treadmill a few weeks ago from Sears. 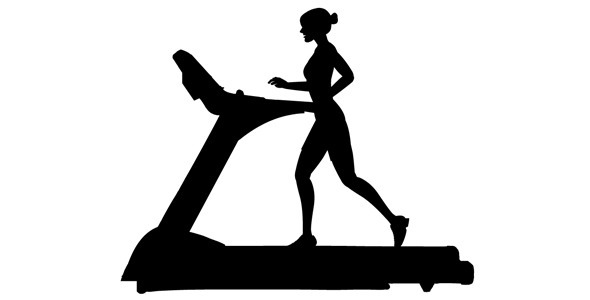 I will be posting a review on my new NordicTrack T5 zi Treadmill (HERE) really soon. It was a sensible purchase. Reasonable amount of bells and whistles. It rocks. My dad suggested that we move the treadmill upstairs. We have four bedrooms, but three rooms were taken as bedrooms. The fourth was used as our home office and toy room. I decided to clear out some of the big toys and get rid of things they've grown out of. After that was done, I cleared out our home office. This mongo-desk takes up two walls in the room. We purged a ton and packed away items that we wanted to keep, but didn't necessarily need to access. The result is a nice, multi-functional space: a home office, a toy room ... and a new home gym!! I now have sunlight and am able to open up the windows and air out the room and keep it cool. This has made such a difference! The kids can play on the computer while I run, too. The desk is filled with cabinets, shelves and under-lighting. These cabinets use to be filled with books, junk and more junk. 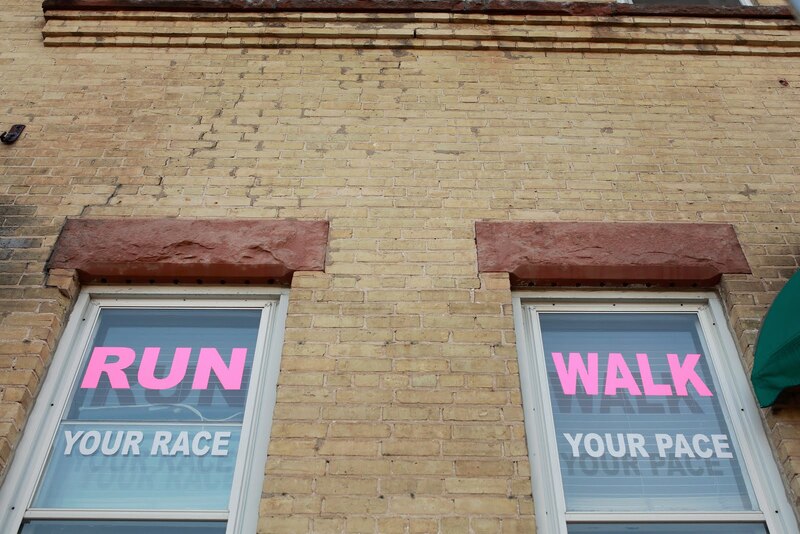 Now, they are a great way to display all of our race photos and memorabilia. Tons of toys to keep the kiddos entertained while I workout. (Sadly, this is only one of three rooms that houses their toys!). Since Wisconsin Winter is right around the corner ... I have a feeling that we'll be spending a lot of time in this room (for several reasons). I am looking forward to lots of fun times ... and lots of calories burned ... in our new space.